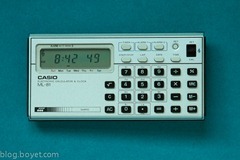 For your jaunt down memory lane today, I present another calculator from my collection: the Casio ML-81. On the one hand it’s a four-banger with memory, but on the other it plays music! Click the picture to expand it, take a look at the keys really carefully and you’ll see that they are marked Do, Re, Mi, Fa, Sol, La, Si, etc. When the little slider switch top right is in the treble clef position, the calculator will ding every time you press on of the number keys. Not only that, but if you do a calculation, it’ll play the answer to you. Now admittedly the notes are entirely artificial, electronic, and ting-y, but they’re there. Not only that, but it has clock functionality as well. So there’s the current date and time (you can see when I took the photo, for example) which chimes on the hour every hour, stopwatch and timer functions, and there are two alarms. And, when in the awesome treble clef position, the alarms will play a little melody when they expire. Alarm 1 plays the beginning of Frühlingslied by Mendelssohn and alarm 2 plays Traumerei by Schumann. (The timer plays a tune when it reaches zero: Schubert’s Moments Musicaux No. 3.) All pieces are twenty four seconds long. So, why do I have this calculator? Apart from it being an entirely awesome piece of consumer electronics, that is? To be honest I bought one back in the mid-80s just for the fun of it. It was cheap enough that it was just a spontaneous purchase: I saw, wanted, bought it. Probably in some electronics shop on Tottenham Court Road, if truth be told. I even used it as my wake-up alarm instead of a boring old clock for a while. And then my flat was burgled one day and they took it along with my hi-fi, CDs, and other stuff. Then, about five years ago, maybe more, I spotted one in an auction on eBay (NOS - New Old Stock, as they say) and bought it for $50. That’s the one you see here. I keep it out on my bookshelves (in its cover) and it still merrily chimes the hour. UPDATE (18-Sep-2017): I changed the batteries just now and I needed to set the date on the calculator. After looking online (it was easier than trying to find the manual) and finding a couple of ... inaccuracies, shall we say, especially with regard to the support for dates in the 2000s, I decided to describe the process here so I can find it next time. Flip the top-right switch to Set. Press AC to clear the display. The calculator expects a date in Y-M-D format. For a date last century, first type the two-digit year (dropping the "19") then press Date. For a date this century, type the four-digit year then press Date. Now type the two-digit month, followed by pressing Date, then the two-digit day and press Date. The day of the week is calculated for you. Finally press the recessed Set button. If the date is in the last century, it'll be shown with dashes, if it's this century, it'll be shown with spaces. This difference tells you whether it's 19xx or 20xx. I have the same one, purchased in Tokyo in 1979 or 80. I love it -- and it still works fine after all these years, including once falling off the roof of a speeding car (!) (It has a little dent.) I think the musical feature makes me more accurate -- you can "hear" if you've hit the wrong key. My dad had this ... eventually it passed to me ... and one day I took it to school and some absolute tosspot stole it when I wasn't looking. PS, please, please record it playing each of those melodies and put them on youtube, I'll love you long time. Or at least, a grand total of approximately 60 seconds. The manual only said two of the titles, and it's been about 18 years now, so I can't remember which one's which, other than Traumerei (which I have on a classical compilation...), so it'd be good to figure out which title corresponds to which tune. PPS it's not a four banger - it's got square root as well! It's totally a valid mathematical tool. And it can do date calculations as well, e.g. tell you how many days are between two dates, which is well handy. Tell me where I can buy a Casio ML-81. John: Dude, I stated in the article where I got mine ... eBay. As I write this there are three for sale there. My husband had what I think was the Casio ML-81 (his got stolen too). We loved one of the little melodies it would play as an alarm. I've been trying to figure out what it was. Do you know the names of the songs it plays or do you know where I might find either the names of them or recordings of them online? I'd love to find a calculator to replace the one stolen but I want to be sure it's the one with that little song we liked so much. Linda: I'll have to see if I can't record the tunes on all the musical calculators I have when I have a spare couple of hours. I am interested. For how much are you selling this? Hi Linda, one of the tunes is Fur Elise..I myself am trying to figure out the other one..
Me, in the original article: "I spotted one in an auction on eBay (NOS - New Old Stock, as they say) and bought it for $50." Me, in comment #4: "I stated in the article where I got mine ... eBay. As I write this there are three for sale there." Me, just now: There's one currently for sale on eBay. Also, by checking the completed listings I see that one appears possibly once a month. Just add a watch for one in your account on eBay. @Denny: I use Duracell 303/357 silver oxide batteries, and they last forever. If you want to use alkaline batteries, then it's LR44.